Janrain’s Registration UI and Single Sign-On products are client-side web applications that generate Janrain access tokens when a user is authenticated to create a client-side “session”. A Janrain session is only dependent on the presence of a valid access token stored in the user’s browser and is not connected to a server-side session without integration on the customer’s side. The overview and more detailed sections below should help you determine whether server-side session management is required for your use cases. See the Access Tokens and Codes section for more detail on each of the tokens referenced. Client-side “sessions” may require less integration effort if you do not require server-side integration. However, Janrain does not provide a refresh token client-side, so the “session” will expire unless a new token is generated server-side. Outside of the code-for-token exchange, an API client with the access_issuer feature must be used to generate an access token. Server-side session management requires more integration effort but is potentially more secure. 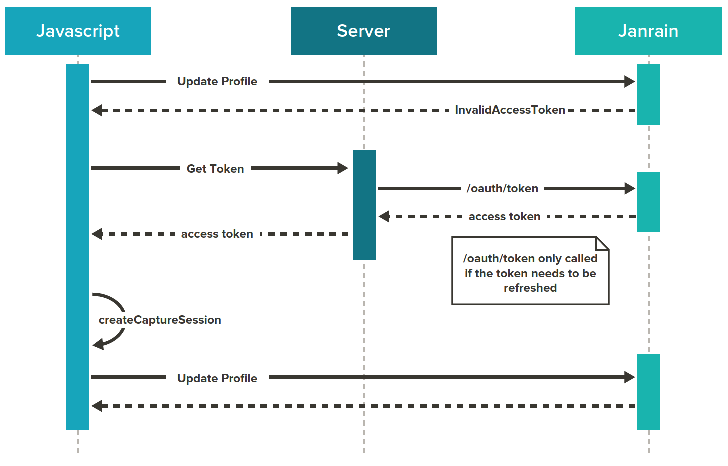 The user’s access token does not have to be exposed client-side, but if users need to be able to access Janrain profile screens you will need to implement code placing an access token into localStorage when necessary. In the code-for-token exchange, you can use the same API client with the login_client feature client-side for authentication and server-side for refreshing access tokens. An access token being present in localStorage tells the Registration UI that there is an active “session” for the user, which allows access to Janrain screens configured to display user data, such as the editProfile screen. The client­-side “session” will expire when the access token expires, one hour by default, and refresh tokens are not available for use client-side. In order to access Janrain screens that require an access token, the end user will need to reauthenticate through the Registration UI. After a user successfully logs in, collect the uuid, access token, and expiration time from the onCaptureLoginSuccess event response and store them server-side. When the access token expires, use the uuid to make a server-side call to access/getAccessToken to generate a new access token. The authorization code must then be passed to a server and exchanged for an access token and refresh token, which must be stored in the server session and refreshed as needed using the oauth/token endpoint. With this approach, the access token is not placed in localStorage, which means there is no client­-side “session”. A customer using the Registration UI can optionally create a client­-side session when performing the code-for-token exchange. To avoid expired access tokens, this server code should be used with each page load (or server request) to check the access token stored in the session and refresh it if it has expired. In this way, the sever session is “managing” the access token and will have a valid access token for as long as the session is valid. The end­-user can use the Janrain Registration UI to log out, which will fire the onCaptureSessionEnded event handler. This can be used to send a request to the server to kill the session.